Generally, you can stream, watch, upload the videos freely. But sometimes, you must have noticed that while you try for uploading a video like MP4 to YouTube, you come across a variety of troubles that end in a restricted or unsuccessful file uploading. In this article, we talk about how to upload MP4 to YouTube successfully. Why Can’t I Upload MP4 to YouTube Video? Out of all the reasons for an unsuccessful uploading of MP4 to YouTube, one is the codec of the file. Mostly the YouTube accepts MP4 files but that requires a certain codec for the file. So, if you are trying to upload a file to the said website (YouTube) and it is in MP4 format but the codec for the video or audio is not suitable for the accepted one then it will cause such troubles of unsuccessful or no uploading, at all. Size of the video also affects the file uploading. Bigger is size, longer will be the time period for uploading and if during this uploading process, internet connection is lost then automatically the file uploading will get interrupted or stopped. Brorsoft Videomate is a professional MP4 to YouTube converter allowing you to change your incompatible MP4 files to compatible format with YouTube site for uploading with fast speed while delivering exquisite picture. Besides, before converting your movies, you can use the built-in video editor to trim the videos into multiple segments with short duration and personalize the videos to achieve a better overall effect. If the file is too large, you can also compress videos for YouTube with this smart tool. More notably, for those who are not professional with video format, you needn’t study much about your file format, this top MP4 video converter for YouTube furnishes output profiles for YouTube, thus enabling you to directly convert MP4 to YouTube for further uploading in simple clicks. If you want to upload MP4 files to YouTube on Mac(macOS High Sierra), please turn to Brorsoft Videomate for Mac. 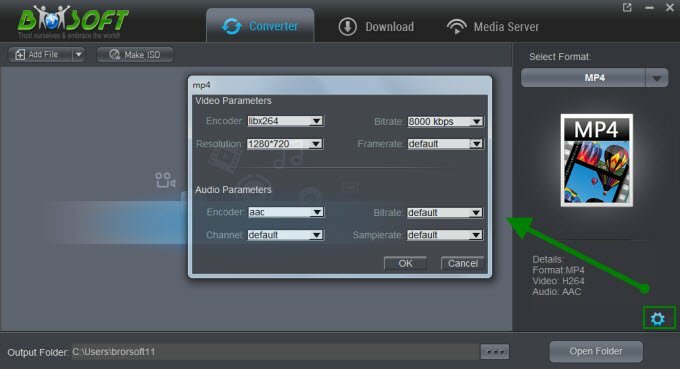 After launching this MP4 to YouTube converter software, please go to Add button to import videos under “Converter” page. Go to the “Format > Web” category and select the “YouTube” format. 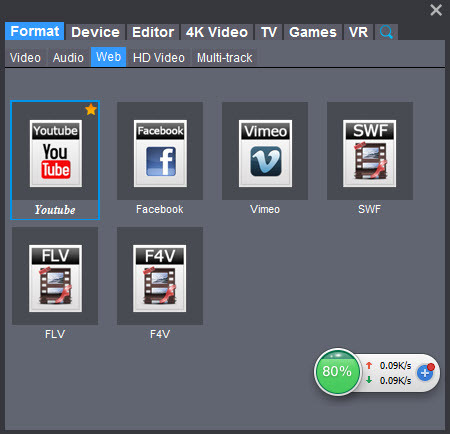 This will have your video converted to the format best for uploading to YouTube. The H264 will be used as its video codec and the AAC as its audio codec. A. You can press the Settings button to adjust the video size, bitrate, frame rate, audio sample rate, etc to optimize the quality. The highest video resolution that YouTube support is 3840*2160. And the common frame rates for YouTube include: 24, 25, 30, 48, 50, 60 frames per second. B. Click “Edit” button and you can trim, crop or adjust the video with the built-in video editor to get the very part and effect of the movie you want. Here, to cut long MP4 video, just turn to “Trim” tab to cut the MP4 videos into smaller parts to get the very part you want. Click “Start” button to start encoding MP4 for uploading to YouTube. 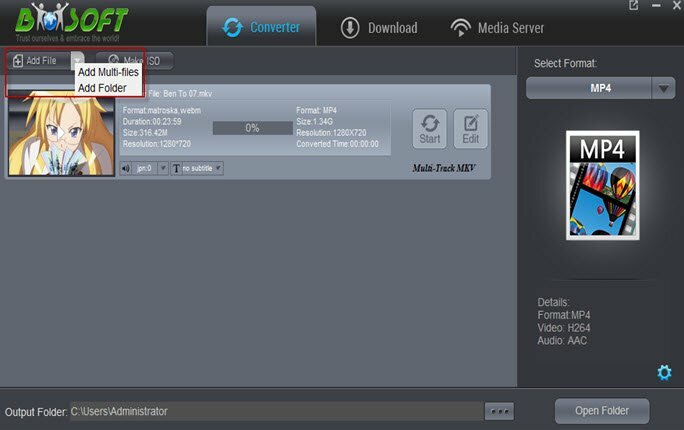 After the conversion, click “Open” button to get the exported files and then upload the converted MP4 files into YouTube for sharing with your friends, families, and fans. This entry was posted in MP4 and tagged compress mp4 files for youtube, convert mp4 to youtube, share mp4 video on youtube, upload mp4 to youtube, youtube file size limit. Bookmark the permalink.